During the shoulder season of crop harvests, organically grown field lettuces produce some astonishingly high yields. During the shoulder season of crop harvests, organically grown field lettuces produce some astonishingly high yields. We’re proud of these amazing yields because these organically grown field lettuces are some of our tastiest crops. Grown in the soil here at our family farm, you can rest assured all of the nutrients remain bound to the lettuce long enough for them to reach your customers. Whether you are a restaurant, a company responsible for produce supplies, or a CSA, we are more than happy to offer you our delicious field lettuces. What Nutrients Are in Lettuce? 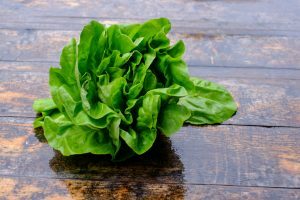 While lettuce might seem like all it has to offer is some water and blandness, that couldn’t be farther from the truth. Protein, fiber, and sugars are some of what you’ll find in lettuce. There are plenty of vitamins too. Get your next helpings of calcium, iron, potassium, riboflavin, and vitamin K all from lettuce. If regular lettuce is this packed, just imagine how beneficial organically grown field lettuces are! Fights Inflammation: Did you know that lettuce can fight inflammation? If you suffer from the effects of inflammation, trying eating some lettuce. Lettuce contains two biocatalysts which are called lipoxygenase and carrageenan, both of which can help lower inflammation. Nurtures Brain Cells: Your brain is the most important part of your body. You should do all that you can to protect it and make it healthier. Lettuce can nurture brain cells. Memory loss and more advanced conditions such as Alzheimer’s can potentially be prevented when your neurons are bolstered. Reduces Cholesterol: High cholesterol levels can lead to several unpleasant and risky health conditions, such as heart disease. But luckily, eating lettuce can help reduce your fat and cholesterol levels, and in turn, protect you from major health events like heart attacks and strokes. Helps You Sleep: In our busy lives, we tend to lose sleep all too often. Luckily, lettuce can also help you sleep. Since both your brain and your muscles relax, you can fall asleep more quickly. Fights Cancer: October is Breast Cancer Awareness Month, so it’s only fair that we mention how lettuce, especially organically grown field lettuces, can help fight cancer. Studies have shown that lettuce extracts have proven effective in treating breast cancer. WANT THE FRESHEST, ORGANICALLY GROWN FIELD LETTUCE? CONTACT US TODAY! This entry was posted on Friday, October 6th, 2017 at 12:10 pm. Both comments and pings are currently closed.